Corbin Hillam has been an illustrator for over 35 years. His drawings have appeared in over 200 books, mostly for children. He has been painting public murals since 2006. He works in both chalk and paint, indoors and outdoors. Corbin's books are mostly in the area of educational publishing, both secular and religious. He has written and illustrated three of his own books for children. His murals have appeared in elementary and middle schools, climbing gyms, and private homes. 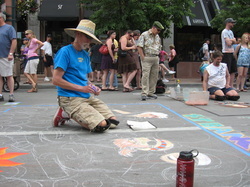 He also specializes in outdoor chalk murals. His clients include Pioneers Museum, EpiCentral Workspace, Colorado College, Mountain Chalet, and City Rock Climbing Gym.